75 dF at trailhead, about 70 dF at the summits. Cloudy/overcast skies with at times 40 miles visibility. Very light intermittent breezes through the trees — approximately 5 MPH. 30 MPH wind out of the north on Sugarloaf summit. Car: 0930. Trailhead: 0915. Sugarloaf summit: 1245. Spaulding summit: 1440. Car: 1800. Approximately 10 miles, 8.5 hours. This one took awhile longer than last. To say the trail is more technical is about right, and by a very comfortable margin. The top of Sugarloaf is very rocky, and there’s a small section where it gets fairly near vertical. Oh, and mud. Lots and lots of mud. In many ways, I miss snowshoeing up mountains on pristine, tramped down trails. Locally, the Crockers, just across the road, were easier, without a doubt. But there’s something to be said about hiking in warm weather. I mean, there are friendly people on the trail, the flowers and trees are full of life, and the streams are bubbling with fresh, ice-cold mountain water. Yin, meet yang. There was the same walk down the fire road to the trail head as I had for the hike up the Crockers recently. A small cairn pointed the way into the woods, with a familiar white AT blaze reassuring me that I was on the right trail. Before long, I crossed the south branch of the Carrabassett river — jumping from rock to rock for the first half, then across a wooden board for the second. From there, the trail ascended through the forest, whose floor was dense with ferns and other undergrowth. Birches, and a very occasional aspen dotted the landscape. Higher up, the lowland deciduous forest slowly gave way to conifers, and in places, it got very thick. There was a nice overlook at one point, looking into a glacial cirque on the western side of the mountain. I spied a brook carving its way downhill, draining the upper slopes of the mountain into the Carrabassett below. Thousands of years from now, that cirque won’t be the same for all that scouring action. 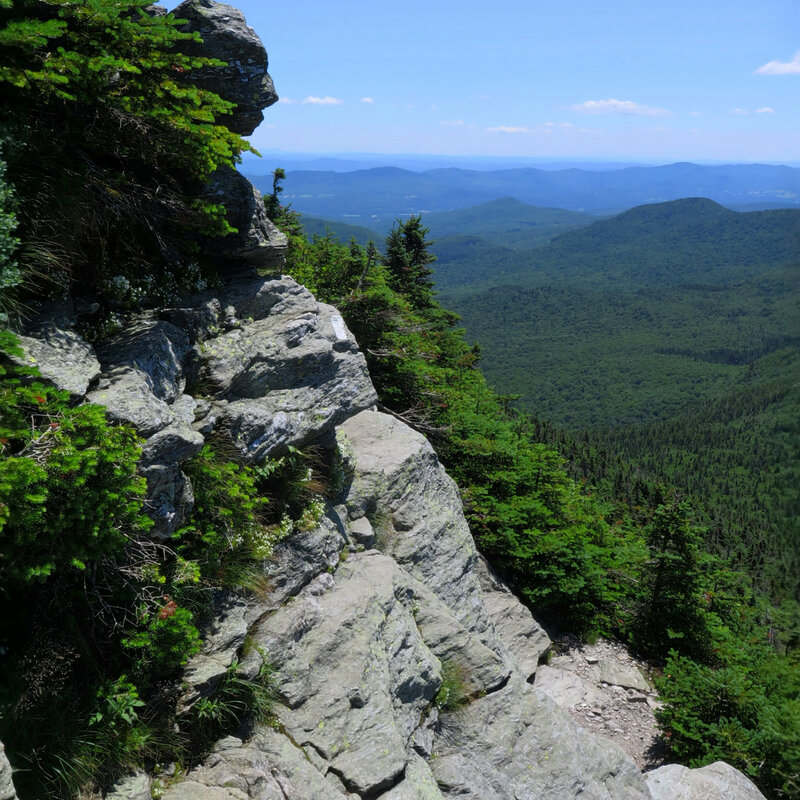 The top of Sugarloaf was very rocky — in the same vein as Abraham, Guyot, or the northern Presidentials — but shorter and perhaps a little less painful. I turned to Spaulding, a little over 2 1/2 miles away. The trip across the col was a bit long, but relatively gentle. I made great time heading over, passing numerous AT thru hikers along the way. 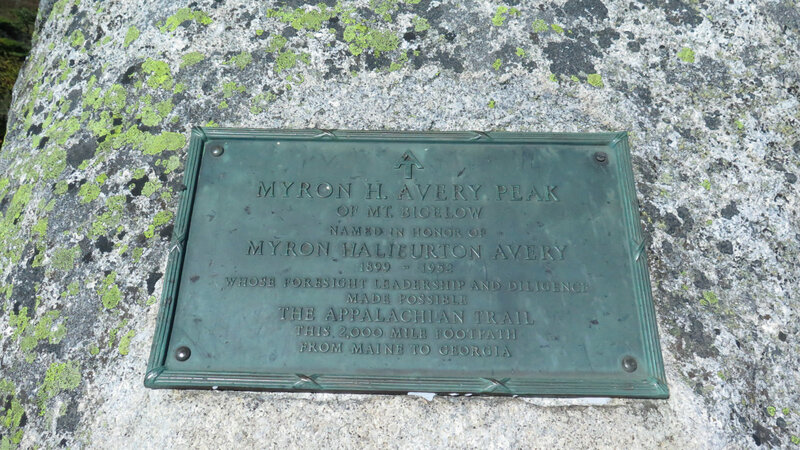 There was a point along the way where I passed a bronze plaque, commemorating the completion of the AT by the Civilian Conservation Corps, back in the 1930s. 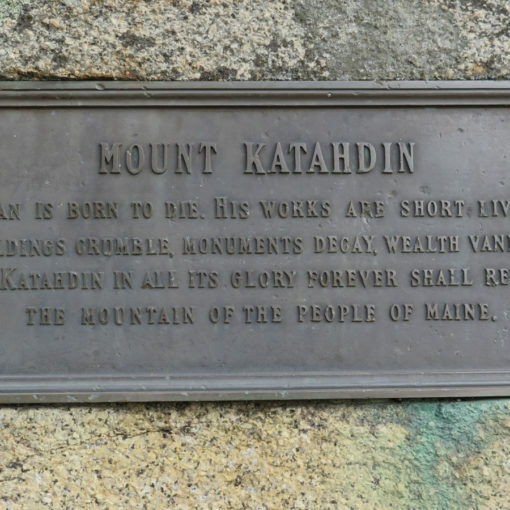 Coincidentally, it’s also about 200 miles from there to Katahdin, and someone had scratched “200” into the dirt at that point. Let me just say, you’d need a jackhammer and blasting caps to get the smiles off the NOBO hikers on that part of the trail. That happiness was infectious. Though the weather was mainly cloudy and at times wet, bright spirits prevailed. I met “Duo”, who was having his lunch trailside, and we chatted a bit. Nice guy, and he gave me a bunch of valuable insights on the AT. Nice. It’s people like him that are going to have helped me prepare my mental game when it’s my turn to set out from Springer mountain. Spaulding was viewless, but a short (maybe 25-ish very easy yards) path led to a nice overlook. 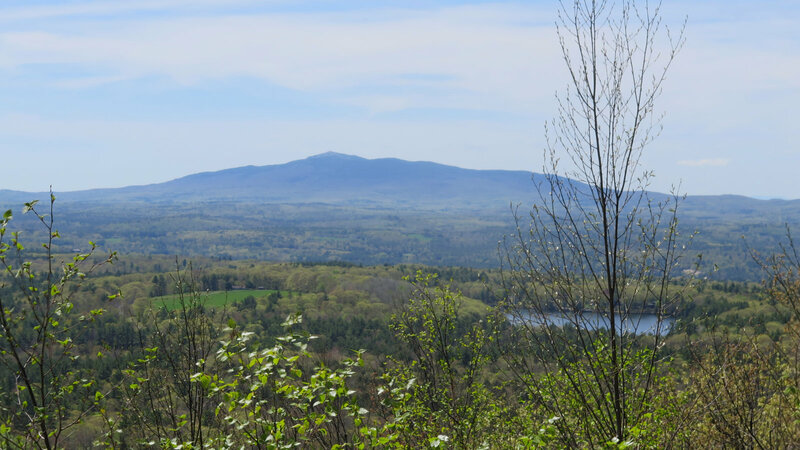 One could see Sugarloaf in all its glory (albeit with its three cell towers — though you’ll get fantastic signal.) Then it was time to turn back. Here and there, I caught fine views in this direction and that. 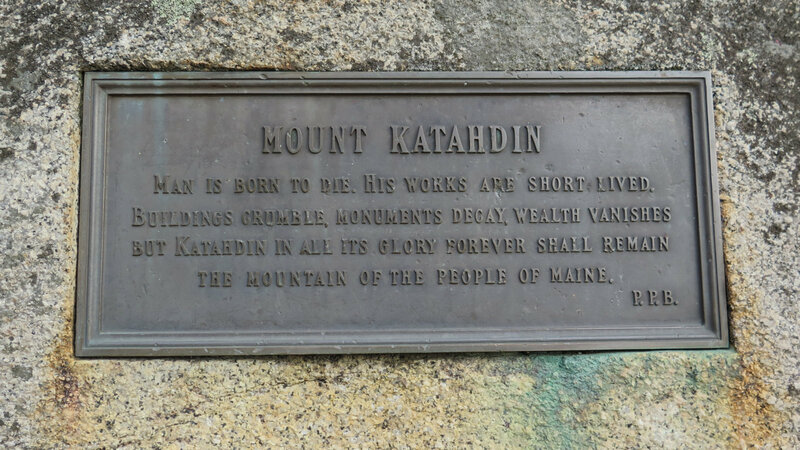 I really wish the Carrabassett Valley was closer to home, because it’s such a magical place… but then again, its remoteness is no-doubt part of its magic. My phone’s app suggested that a peak in the far-off distance was Washington, and I’m not sure I doubt it. If the air were clearer, I’d know for sure, of course, and that’s probably a good enough reason to return as any. Certainly the mountains are classics. Vermont left me unsettled, but Maine has rolled out the welcome mat, for sure. Pictures to follow in a separate post.